“The addition of this street smart new truck to the Hino Australia line-up less than two years after the successful launch of the 500 Series Wide Cab models will further expand and improve our product offering in the highly competitive medium duty category,” said Daniel Petrovski, Hino Australia’s product strategy manager. 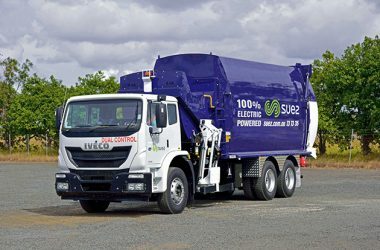 “Hino Australia will launch the all-new 500 Series Standard Cab with the most comprehensive active safety package offered by a Japanese manufacturer in the current Australian medium duty category market, he added. “There will be new power and torque ratings and more transmission options creating a myriad of driveline solutions designed to deliver the next level of driving performance and fuel efficiency. “The all-new 500 Series Standard Cab will epitomise the Hino development philosophy of Quality, Durability and Reliability (QDR). “With an all-new modern interior, we believe the Hino 500 Series Standard Cab will raise the bar for style and occupant comfort amongst the Japanese manufacturers. “The 500 Series Standard Cab is a model that has very strong historical significance for the Hino brand and this next generation will ensure that the FC, FD and FE models continue to play a pivotal role within our extensive product offering. “These new vehicles are designed to offer a combination of active safety, performance, efficiency, comfort and reliability and will set new benchmarks for what Australian customers can expect from a medium duty Japanese truck,” concluded Petrovski. Full Australian specifications and pricing of the all-new 500 Series Standard Cabs FC, FD and FE models will be available in late November 2018 at dealerships nationwide and online.